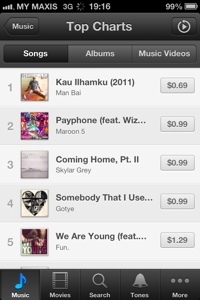 I find it fascinating to watch the Top Songs in iTunes Malaysia Store and see the rise of Man Bai's Kau Ilhamku from nowhere to now Number 1 song in iTunes. That says a few things: it's a great favorites and second, people love $0.69 songs! Also, the fact that the Top 10 changes every day shows a healthy legit customers in Malaysia. That is really good news for the local artist. I would bet that Mr Man Bai would be surprised at the sudden pay check he's getting out of now where if it were not for iTunes. On the other hand, poor brick and mortar CD shop!